Growing up in Germany, I was unfamiliar with pie until I came to the U.S. Germany embraces sweets and desserts, boasts bakeries and confectionary shops, is home to many different cakes and cookies, tarts and tortes. But PIE is not to be found. Upon my move across the Atlantic I was quickly intrigued by the variety of pies and at the same time a little intimidated by baking them at home. I managed to create decent apple and pumpkin pies but did not experiment much outside these two basics. 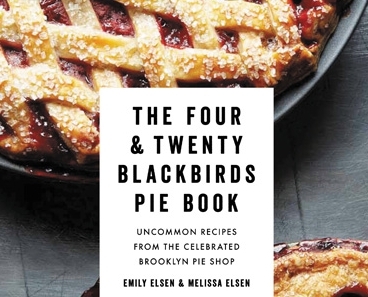 That is until I came across The Four & Twenty Blackbirds Pie Book by Emily and Melissa Elsen. The book is beautiful and includes a very attractive photo for each recipe as well as full page pictures and illustrations for pie dough technique, lattice tops, crimping and prebaking. The recipe section is divided by seasons and for the upcoming winter, for instance, features among others Egg’n’Grogg Pie and Green Chili Chocolate Pie. Each recipe starts out with a little story about that particular pie and why a certain flavor combination was chosen. The ingredients are for the most part straight forward and easy to find in a well-stocked grocery store or farmers market here in Iowa. The instructions are precise, not difficult at all to follow and include a crust pairing, one of the ten recipes for different pie doughs at the end of the book. All the pies I have baked turned out beautifully (honestly, very close to the appetizing photos) and were delicious. I especially recommend the Rhubarb Pie on page 76 and the Balsamic Strawberry Pie on page 80 when spring and summer come around again. I also enjoy the story behind the book for its great entrepreneurial spirit and the bakers’ food philosophy. The authors Emily & Melissa Elsen are sisters from South Dakota whose family owned and operated a café. Both of them left the Midwest to pursue nonfood careers, traveled parts of the world, just to find themselves in Brooklyn, NY during the economic downturn opening up a pie shop after friends kept asking for their home baked pies. Last but not least, I like their slow food mentality of using fresh ingredients that are in season, preferably locally sourced, and preparing them with care. I discovered this book in the wonderful cookbook section on the second floor of the Cedar Rapids Public Library. Go check it out and bake a pie!